A solo album of piano arrangements may seem like a million miles from the days of progressive rock with Yes, for which Rick Wakeman most famously played the keyboard, but he had long harboured designs on becoming a concert pianist, an itch it would seem that won’t go away. 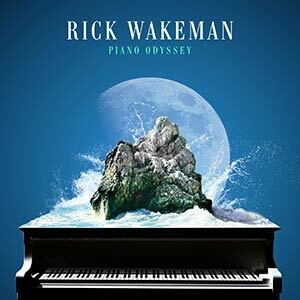 Piano Odyssey is a follow-up to last year’s Piano Portraits, and presents twelve tracks in which Wakeman tickles the ivories accompanied by orchestration from The Orion Strings and the English Chamber Choir. The pieces selected for inclusion in Piano Odyssey include much-loved popular music by the likes of the Beatles, Simon and Garfunkel and Queen, as well as classical pieces and original compositions. In its scope, Piano Odyssey is an ambitious project, and in its execution, is has plenty of musical pleasure to offer casual and critical listeners alike. It opens with George Harrison’s While My Guitar Gently Weeps, which introduces the concept of Wakeman playing around the melody on grand piano, while the haunting choir and strings creep in to enhance the mood. The Beatles are returned to later with Strawberry Fields, but from there, it’s a diversion to Liszt’s Liebesträume, familiar to fans of classical music. The fast piano pace of And You & I, a nod to Yes fans, is impressive. The Boxer (by Simon and Garfunkel) is the first track on the album that is an indifferent version of the masterly original, and the trouble is that it never hits the song’s emotional heights. This may be that in parts, the melody is picked out by a single note rather than blocks of chords, leaving it thin, and it sometimes meanders too far from the familiar version without entrancing with something new. The repeated chorus of the song, such a powerful refrain, doesn’t come through here, and the choral accompaniment is lost. Sadly, another disappointment is the final track, Bohemian Rhapsody, based on Queen’s 1976 masterpiece. It has everything thrown at it, from a choir and orchestral arrangement to a plucked guitar accompaniment performed by Brian May, no less. But the overall effect is a touch cluttered, and lacking in the necessary operatic bombast that made the original so unique and memorable. The danger of choosing renditions of big songs is that piano arrangements can end up sounding too thin, rendering it background music. The stronger tracks turn out to be the original compositions, which command the listener’s full attention. Rocky (The Legacy) is moving, inspiring, hopeful yet melancholic. The story behind it, of a bear rescued too late from a decade of torture by Animals Asia, clarifies why it is so emotionally punchy. Similarly, Cyril Wolverine is a tribute to Wakeman’s adopted bear of that name, and it also captures the dignity of a creature treated so abysmally by humans. Touchingly, the album is dedicated to Rocky and Cyril. The overall balance of the album is that some tracks are stronger and more appealing than others. Ultimately it’s down to the conviction of the new piano arrangement. The Wild Eyed Boy From Freecloud takes Bowie’s song and gives an energetic piano arrangement where chords effectively create moments of bombast. Other tracks, such as Strawberry Fields, whilst attempting a distinct variation on the theme, don’t quite satisfy, even with accompaniment. If you enjoy the delicious combination of piano and strings, with a choir thrown in, then there’s plenty on Piano Odyssey to thrill you. Rick Wakeman is a musician of considerable skill, with a rich legacy, and in recording his piano albums, he’s proving he has plenty of creativity still to offer and wider audiences to reach. It’s the tracks that aren’t originally Wakeman’s work, with a few exceptions, that give the album a few dips. Nevertheless, when he lets rip on the ivories for Jane Seymour (which he wrote for his 1973 solo album), transposing the Bach-like organ arrangement to piano, it’s electrifying, and a track that could easily stand on its own without the choir. The merging of popular and classical is almost seamless, so the overall effect of Piano Odyssey is strong, and it is sure to find broad appeal.